Drake Hosted: How do I set up a Topaz signature pad to work with Drake Hosted? The signature pad must have a "Virtual Serial via USB Connection" interface. The Topaz models with BSB interface are designed for use in a Citrix environment and should work. See the Topaz Drake Private Webstore for more information. The Topaz SigLite LCD 1x5 T-LBK-460-BSB-R has been tested with Drake Hosted. 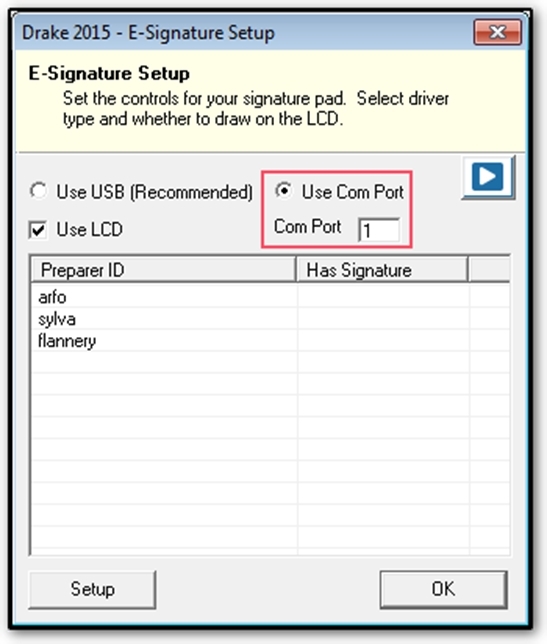 In Drake (opened in Drake Hosted), you must identify the COM port that the signature pad is using and enter it in e-signature setup. Open the Device Manager via Control Panel on your Windows machine. In Windows 7 or Windows 10, you can access the Device Manager by typing device manager in the Search field on the Windows toolbar, selecting Device Manager from the search list and pressing Enter. If more than one communications port is displayed, contact Drake Support, (828) 524-8020, for assistance in determining which COM port the signature pad uses. Close Device Manager and open Drake in Drake Hosted. Complete the setup of your signature pad as directed in Related Links below. If you experience issues using the above settings in Drake Hosted, try removing the check Use LCD on the E-Signature Setup window. For assistance in setting up your signature pad with Drake Hosted, call Drake Software Support at (828) 524-8020.